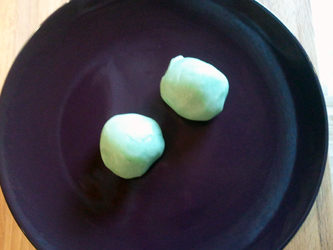 This is a simple playdough recipe that uses jello to color and provide texture. The jello makes it sound tasty, but I don’t recommend trying to eat it! Knead until cool enough to touch. A good playdough recipe doesn’t take all day to make and this one only takes about 8 minutes. 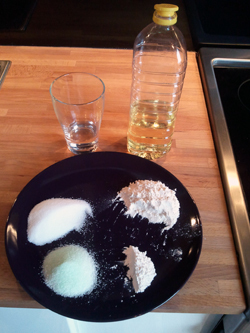 Another great playdough recipe is our microwave playdough recipe, take a look at it. 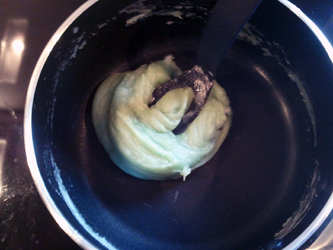 The final result of this playdough recipe (when it comes to color anyway) really depends on your jello. Choose jello with alot of color for a better result. Let’s begin with ingredience assembly. 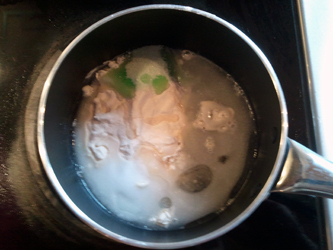 Here we have cream of tartar, flour, salt, water, oil and jello. Pour all ingredients into a pan. Mix the ingredients together. 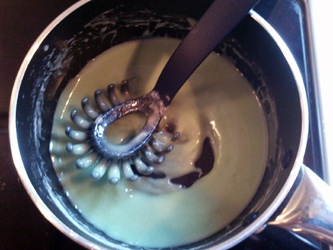 I used a Kiwi jello, since that was what I had in my cabinet. It didn’t do much for color, as you can see. I decided to add some food coloring, to make it look a bit more fun. After heating the playdough for a few minutes, the texture will begin to change. 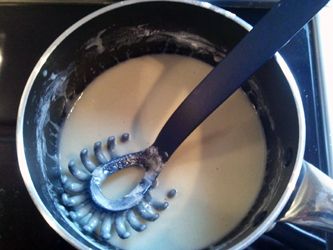 When the mixture looks like below, it’s only 1-2 minutes from finished. 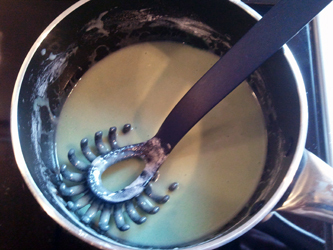 Here’s how the homemade playdough should look when finished. All doughy and nice. The end result should look like the playdough on the image below. Enjoy! This playdough contains salt, something that usually means dry hands after handling it, but the oil actually counteracts that really well. Should the jello be in dry form or as finished jello? The jello should be in dry form. I will add a step-by-step explanation with images shortly. I love this play dough recipe! Made it quite a few times already and it always come out right. The jello play dough smells yummy and is softer than regular store bought play dough. Thanks for the recipe! Always happy to hear about people enjoying our playdough recipes, thank you! I HIGHLY RECOMMEND THIS RECIPE! I MADE THIS DOUGH WITH STRAWBERRY JELLO AND IT HAD A NICE BRIGHT PINK COLOR AND A WONDERFUL STRAWBERRY SCENT! Great! Glad it worked out for you! It should be good for a couple of weeks if you store it airtight in the fridge. It’s basically good as long as it doesn’t smell and the texture is playdoughy. Just found 2 very out of date (may 2007!) packets of jello at the back of the cupboard. They’re only 1oz and one packet worked fine. I also added glitter. Thanks for all the recipes and clear instructions. Made 2 batches with 2 packs of way expired jello and the colours are awesome. Going to recommend this recipe to everyone. Fantastic! Very glad to hear 🙂 Thank you! Love this! I made about 8 large batches easily for a classroom project. Super easy. I ran out of salt and tried it with the sea salt I had in the house and it worked just fine! I even added glitter and it looks great. Thank you for sharing! It will probably work well. Is it sticky from the sugar in the jello and does it stain because of the coloring in the jello?